Homemade banana puddin’ is better than regular puddin’. Adding “homemade” to biscuits, chicken pot pie, lasagna, cobbler, or banana puddin’ makes them sound more desirable to me. 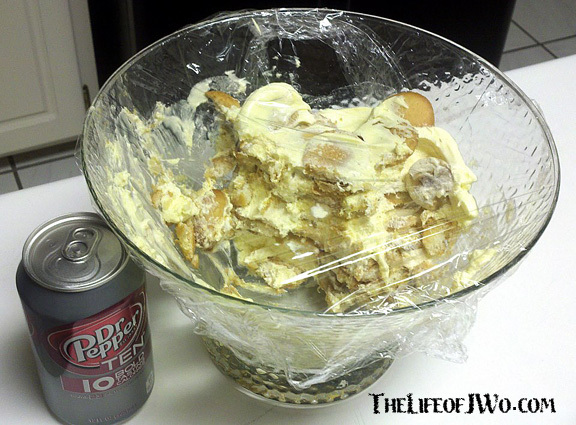 My battles with homemade banana puddin’ are legendary. In case you missed it, I said “usually” saying something is homemade makes it better. There’s one thing that I avoid like the plague when someone tells me it’s homemade. This is what my brain thinks how homemade soap is made. A few years ago a coworker’s wife made a bunch of homemade soap for everyone in the office. She had the coworker, who I’ll call Randy, bring them to work in a big, decorated basket that he left on a table in the break room. Each bar of soap was sealed in clear, plastic bags complete with ribbons. It really was a nice display and I could tell she spent a lot of time putting it together. Still, I decided not to get anything since I knew I wouldn’t use it. 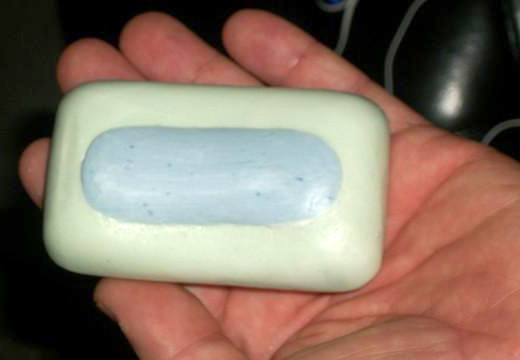 Then I heard Randy walking around the office asking everyone if they had gotten some homemade soap from the break room. Since it was a small office, I had no way of avoiding him asking me. Randy: Did you get any homemade soap? My wife made it. Me: Oooohh… No, not yet. Randy: Well, there’s plenty of it in the break room. Go ahead and get you some to take home. Me: Thanks man. Will do. I handled it politely and figured that would be the end of it. Later that afternoon I was getting something from the printer, which meant I had to walk by Randy’s desk. Randy: You get any soap yet? Me: Oooohh… Uhhhh… No, not yet. I’m sure he already knew my answer — his desk was within eyeshot of the break room — and I started thinking he would want me to go in there at that very moment to select something. Randy: There’s some good stuff in there. My wife makes it and there’s plenty to choose from. You should get some before it’s gone. That’s when I crumbled from under the pressure. At this point he’s just staring up at me from his seat, watching me stumble over words and twisting in the wind. Me: When I think of homemade soap, I think someone just took all of the leftover pieces of soap, you know, the slivers, and mushed them all together. I’m making an invisible ball of soap with my hands as I continued to try to explain myself. Got all the slivers in the house together & ready to make some homemade soap for everyone. Me: I know that’s not what it is, I really do. But that’s what I think and I just can’t get over that. I know your wife didn’t just keep all the leftover soaps in your house for a year so she could make “homemade” soaps for us… I mean, I’m sure she worked really hard and all, but I just can’t get over thinking that… That’s why I can’t get any. I was so nervous at that point that I’m not sure if he had cracked a smile or not, but I know he didn’t laugh. Well, I didn’t hear any. I could have missed it due to all the noise my brain was making trying to cobble together complete and coherent sentences. Randy: OK. That’s fine. You don’t have to get any. I just wanted you to know you could if you wanted some. I was sweating by the time I got back to my desk. Despite explaining it so awkwardly, Randy never asked me about homemade soap again. 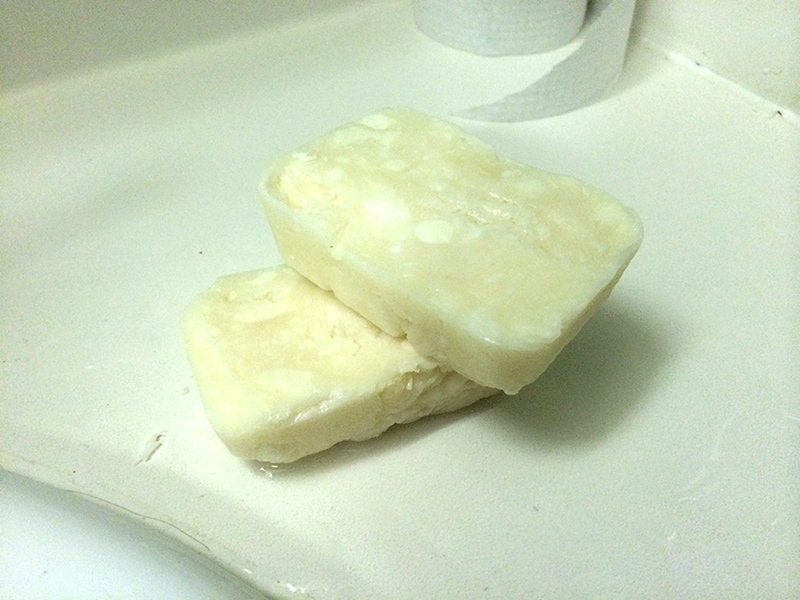 I’ve been homemade soap free since that day with Randy, until I walked into the bathroom where I work now and found these. Thankfully no one has tried to get me to take them home. I visibly shuttered when I saw this was an option in the men’s room at work. Homemade soap math equation = GROSS. Gallery | This entry was posted in Daily Life and tagged coworkers, daily life, family, homemade, humor, life, people, soap. Bookmark the permalink. Hahaha- your thoughts on homemade soap may just make me think twice about using such a thing. Nasty! I know that’s not really how it’s made, but that’s what my brain keeps telling me it is. I just can’t bring myself to use it. Well… At least you didn’t think of the soap from Fight Club when I was offering it to you. You should have told me then. I would have laughed if you did. And I never knew you were sweating it out like that. I never even thought of those soap scrap bars. Gives me a shiver right now. I did tell you. We actually had that conversation at your desk. I was so nervous because I didn’t want you to think I was putting down what she made, because that wasn’t it at all. She had put a lot of time and effort into making them for everyone and I was worried that it was going to sound like I wasn’t appreciative. I knew they weren’t really little slivers of soap, but I just couldn’t stop thinking about it. 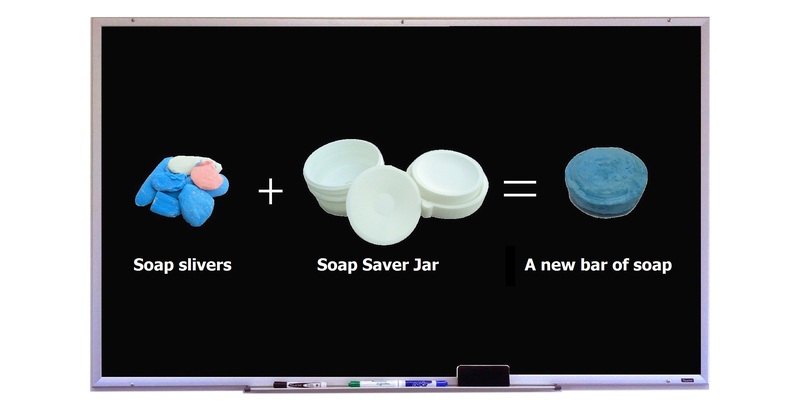 Isn’t there like a sponge thing you can buy to put your soap scraps into to make a “bar”? 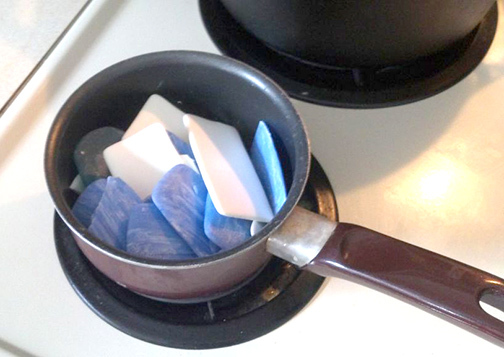 I think there’s some dish (like in the last image) that you can put soap slivers in and have them “magically” appear as new soap. There’s no part of my mind that would consider that as “NEW” soap, especially if the old slivers had been used on another person’s body.